Aussie P51’s in Italy during WW2 | The M.o.B. The North American P-51 is one of the most written about aeroplanes in the history of aviation. Designed and constructed in 120 days to meet the desperate needs of the British government in April 1940 it was a good aeroplane which became great when powered by the famous Rolls Royce Merlin engine. It was the primary fighter in use by the USAAF by the end of World War II in Europe and the Pacific with outstanding range and performance. Other allied nations also flew the aircraft. 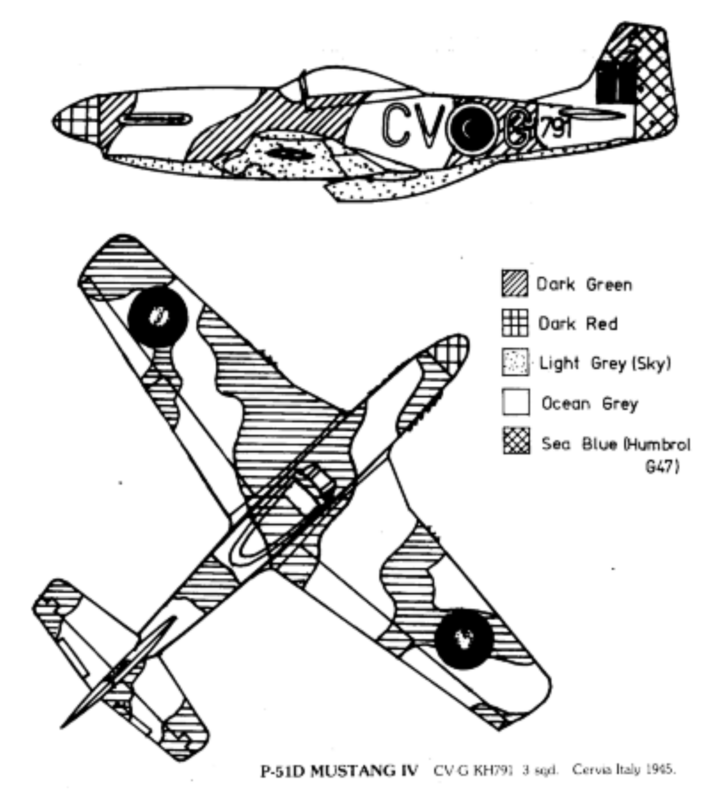 In Australia the Commonwealth Aircraft Corporation began constructing it from 1945. In appearance the major difference between the earlier P-51B and the later P-51D versions was the replacement of the rear decking with a bubble canopy, giving it a modern and highly efficient appearance. A large number of P-51s were handed over to British forces where it was called the ‘Mustang’. The earlier versions were numbered Mustang Mk.I to Mustang Mk.III, the P-51D (and later P-51K) were called the Mustang Mk.IV in British service. The Royal Australian Air Force’s 3 Squadron flew Mustangs with allied forces in Italy in 1944 and 1945. Deliveries of Mustang III’s (P-51B/C’s) and Mustang IV’s (P-51D/K’s) began in November 1944, replacing the Kittyhawk that the Squadron had flown previously. The squadron flew mainly ground attack missions as the Luftwaffe had largely disappeared in the region and used the Mustang’s exceptional range to fly as far as Yugoslavia on the other side of the Adriatic to support partisan operations there. 3 Squadron operated its Mustangs from bases in Italy right up to the end of the war in Europe. Armament: Six 0.5 in (12.7 mm) machine guns plus bombs and rocket projectiles. Academy are making some of the nicest little kits available these days, generally highly accurate, well detailed and very cheap. There are some faults (and the reviewers in the magazines will let you know if they are significant) with some of the kits in the range but overall they are not serious and at the price it hard to go past them in comparison to the more expensive Japanese kits. There are, however, so many P-51D models around that I wanted to make something that was a little bit different, not just another of the hoards of all-silver P-51Ds that crowded the skies over Europe at the end of the war. The solution to this little problem came with an ‘Aussie Decals’ set which provides decals for Mustang III’s and Mustang IVs flown by the RAAF’s 3 Squadron in Italy. With the good Academy kit and what looked like good decals it should have been an easy little job. The kit is pretty accurate and there is no need to do anything serious. I could have opened up the outlets from the radiator that would have improved the look of the model, but I didn’t. The radiator inlet needs thinning down by carving away the excess plastic to make it look good. The kit offers the options of two slightly different shape canopies and the experten at the MoB assure me that the slightly humped one is the right one for a Mustang IV flown by 3 Squadron. The experten also assure me that these Mustangs also go without the little housing on wing leading edge for the inner machine gun. It is an easy matter to remove them and drill a hole for the machine guns. I was shown a plan for the Mustang with the inner housing missing but all of the photos I could find of Mustangs shows all three housings – and I couldn’t find any photos of 3 Squadron Mustangs with the right angle to be sure – but it was too late by the time I started to feel suspicious that somebody might be playing a hoax on me. The experten further assured me that 3 Squadron Mustangs didn’t have cuffs on the propeller while the kit does. Photos suggest that they might be right this time but taking them off the prop supplied in the kit would have been difficult so I peered into the spares box and discovered the prop of an old (we’re talking 1950s here) Airfix Mustang that looks as though it was salvaged from one of the first kits I ever made. I decided to use it instead (partly for its nostalgia value) but after an hour or so’s filing I was starting to wonder if it was a good idea. It still looks a bit chunky in comparison to more modern mouldings, but there it is. The colours are standard RAF fighter camouflage from the late war period (shown in image 3 below) as supplied by Aeromaster, with the exception that I don’t like the extreme greenness of their ‘Sky’ so I consulted my colour references and found something a little less green, FS 34424 from Modelmaster. The reference for the decals gives Humbrol G47 for the rudder which looks a bit too light to me, but I can’t argue since I didn’t have a better reference. The colour drawing with the decals (shown here) doesn’t show the starboard view, neither did any of the photos I had easily to hand, so I guessed. The decals are excellent, sufficient for a Mustang III and two Mustang IV’s. They only supply markings for the fuselage, you have to rummage around in your collection of spares to find the roundels for the wings. The decals also proved to be very fragile so I had to coat them with a clear varnish before getting them onto the model properly. I didn’t test them in advance and one of the serial numbers just disintegrated, so I had to use a serial that isn’t correct for the larger squadron codes. There’s a message there somewhere – actually there are a lot of lessons I learned with this model.